I have been getting several requests to share some of our favorite little one reads so I put together a post with the kid’s current favorites and a bit about how and why we read as a family. First and foremost, I am a big believer in the whole “monkey see, monkey do” thing at this age. I have really beautiful memories of my own mother curled up in her robe on the couch, her nose in a good page turner. She always left it on the side table so she could pick it up whenever she had a free moment, and she doesn’t know this, but I was always curious as to what she was reading. Romance novels, usually. Together we would take trips to our local library where I’d get to pick out my own books and in the summer I did reading programs so I could get free tacos at Taco Bell. I am sure there were other things in the prize basket, but I always choose the tacos. Back to reading. It was always steady current flowing in our home, and although not overtly pushed on me, I gravitated to it simply because I saw my mom enjoying it. I wanted to be like her and now I am doing the same for my kids. We’ve just begin introducing chapter books to Stella and right now I am in the middle of Charlotte’s Web. We read a few chapters every night before bed and have fun talking about farm life and what we think is going to happen next. She is not reading on her own yet, and I am not pushing this, but she is indeed interested. Stella also enjoy the books I read the boys, as I am sure they remind her of when I read those same ones to her as a tiny tot. Most days before nap time I read to help get the boys settled down. I let each pick a book or two before we pile in someone’s bed, and it always helps create a calmer environment for them so they sleep more soundly. 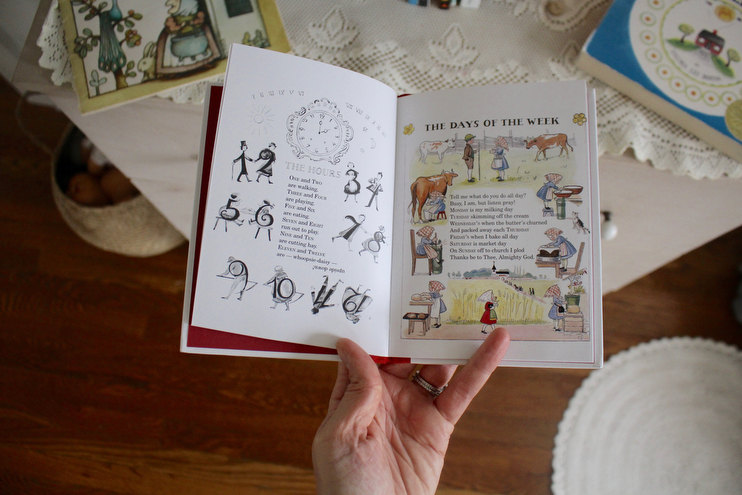 We have built the ritual of flipping pages and running our fingers over images in the stories into our nap time and bed time routines, so the kids are very familiar with it. I usually read to Stella and Andrew will head into the boy’s room, but we try to switch this up a lot. Stella is at the age where she genuinely can sit still long enough for me to read a few chapters and then some. Theodore is at the age where he wants to read the same book over and over and over again. Alfie is at the age where I just try my best to not let him rip them up by using overly enthusiastic voices and making silly sounds to distract his destructive toddler ways. 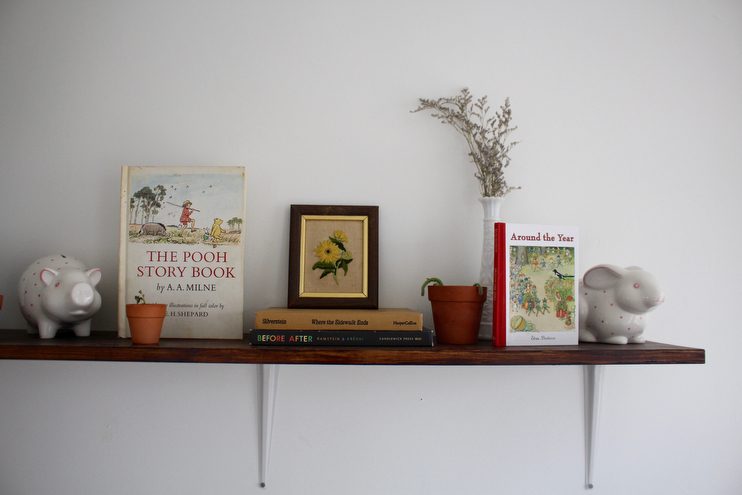 Reading is a constant in our home and we hope to keep it this way! Charlotte’s Web by E.B. White – Here’s a classic piece of literature with manageable chapter sizes. We love learning about farm life over here and this book is a great one to introduce to early readers or kiddos who are interested in longer reading sessions. The movie to go along is also really sweet if you haven’t seen it. 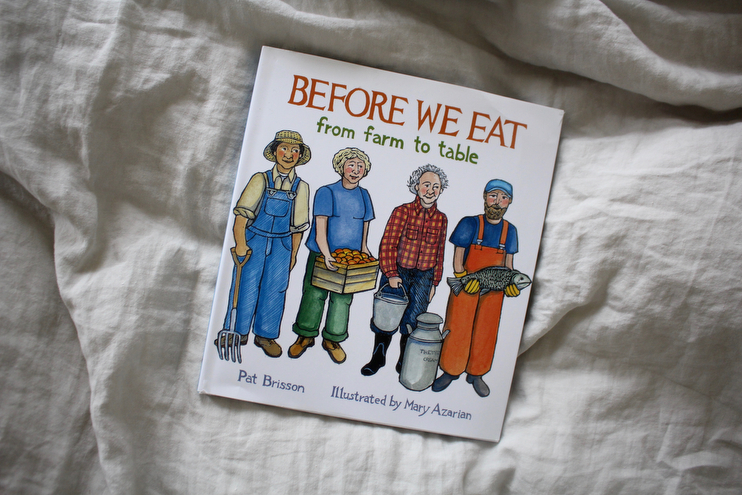 Before We Eat: From Farm to Table by Pat Brisson & Mary Azarian – We got this for the kid’s for Christmas so they could start to understand where food comes from and how it gets to our supper table. Stella has been very inquisitive of this, especially when in grocery stores or markets, so this has helped her learn about the process. It’s not overly complicated and is one Theodore likes as well. Strega Nona by Tomie De Paola – Otherwise known as “Grandma Witch”, this book is a magical one that uses magic & pasta to tap into the kid’s imaginations. It’s a classic and is really fun to read. I will say it’s a little on the weird side, but that’s why I think it’s so great. Little Bear (An I Can Read Book) by Elsa Holmelund & originally by Maurice Sendak – I grew up watching this charming show on TV and it has always been a dear favorite. A few months back we went to take books to our neighborhood library swap and I saw this sitting there up for grabs! I have read it to the kids probably five times now, and it is the perfect book for beginning readers. It takes me back to my childhood and I really adore it. The Fire Engine Book (Little Golden Book) by Tibor Gergly – Theodore is obsessed with all things loud and with wheels, so this is the one we have been reading to him for about two weeks straight. The vintage illustrations are really neat and it goes through the process of being a firefighter. I think I have the darn thing memorized, but he loves it. Before After by Matthias Aregui – This book is open-ended and is without words. One one page is shows a before image, on the on the subsequent page an after image. It’s wonderful to spark interesting conversations and help the kids learn about cause and effect. We also make up stories about the illustrations and they have fun using their imaginations for this. I cannot tell you how many times Stella has requested we “read” this. Around the Year by Elsa Beskow – This books is one we recently added to our Waldorf Library. It is a seasonal book that dances through the months of the year with poetry and whimsical imagery. We plan to crack it open at the start of each new month. Anything by Beskow is a winner, by the way. The Day the Crayons Quit by Drew Daywalt & Oliver Jeffers – This books is hilarious. It is written in the form of letters from crayons who all have a different perspective to offer their crayon owner. Andrew and I have fun reading this is different voices, one’s in our heads we assume each particular crayon would sound like. This kids always roll with laugher when we do. It’s a favorite for sure. The Story of the Snow Children by Sibylle von Olfers – This is another book we have in our Waldorf library. I am obsessed with all the books by Sibylle von Olfers so we’ve been adding them to our book shelves after getting The Root Children as a gift from my birth grandmother. All the imagery is magic. Whenever I read her books to the kids I am immediately transported into another world. The Little House by Virginia Lee Burton – I have been reading this little board book to Alfie almost daily for about a week. For whatever reason he really loves it, and I love that it is inadvertently teaching him the beauty of simple, country life. It is about a little cottage that gets swallowed up by a growing city, so it moves back to where it feels most free: the country. It’s darling. Reading is one of my favorite things to do with the kids, and each season our little ol’ library continues to grow and grow. I’d love to know what books your little ones are requesting you read again and again, or ones you have a crush on? Kid’s books can be so beautiful! Keep reading to your babes and if they are not interested, try to build it int your routine so they have something to look forward to and it will you both a wonderful and meaningful chance to bond. -The Year at Maple Hill Farm: a book that goes through the different seasons of what happens at a farm throughout the year.